(CNN/WPTV) - Police said a homeowner in Sarasota, Florida used a machete to fight off five home invaders early Thursday morning. The attackers were armed with a shotgun when they broke into his home around 4:45 a.m.
A surveillance video shows the homeowner grabbing the machete and fighting back. 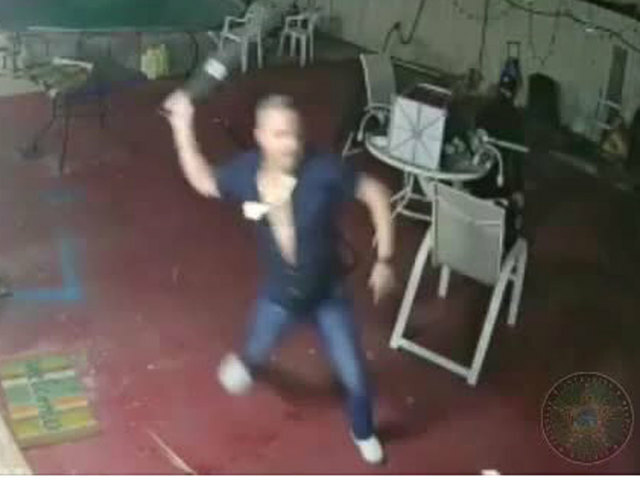 The sheriff's office said video shows the attackers, Alen Beltran-Vazquez, Angel Cabrera-Basulto and Ronier Jauregui-Lorente enter the victim's porch armed with a shotgun, machete and crowbar, in an attempt to rob the victim. Cabrera-Basulto and Jauregui-Lorente are seen fleeing the home while the victim arms himself with a machete and holds Beltran-Vazquez until deputies arrive. The Sarasota County Sheriff’s Office said the homeowner held the suspect until law enforcement arrived. Detectives also identified Jorge Valido-Leyva and Roberto Salcedo-Balanza as the other men who escaped in a vehicle and learned they helped coordinate and plan the robbery. Detectives later tracked down and arrested the other attackers. Beltran-Vazquez is charged with two counts of armed robbery and possession of a firearm by a convicted felon. Jauregui-Lorente and Cabrera-Basulto are each charged with two counts of armed robbery. All five suspects are now facing robbery and other charges.